Q1. How Do I order a Sample? Q2a. How do I get a shipping/product quote and Checkout? 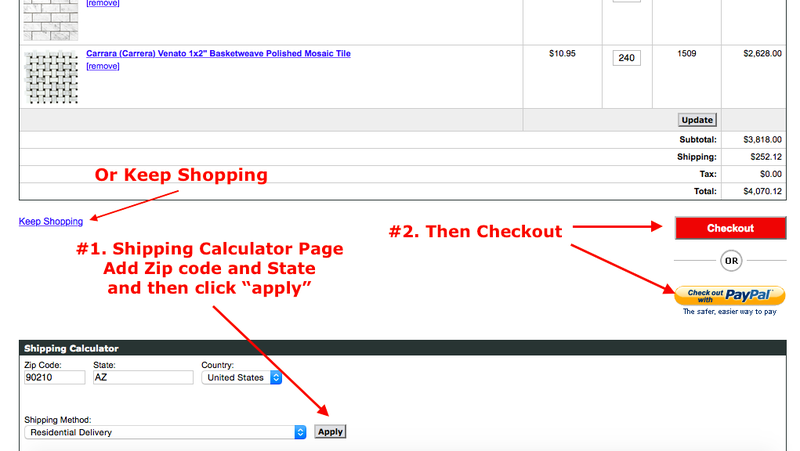 Step#2: This is really it, checkout on the next billing page or click “continue shopping”. Then once you are complete click “PROCEED TO CHECKOUT“ and you will be transferred to the “entering address and billing stage”. Step #3: The Billing page. 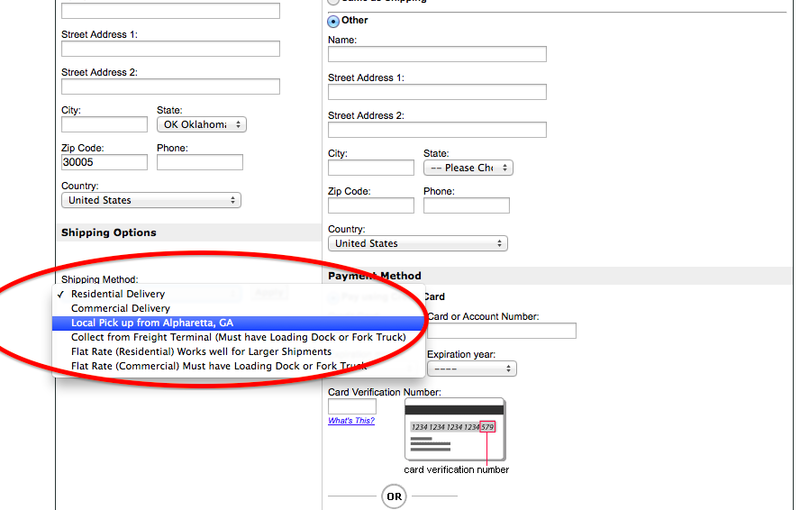 Here you enter your shipping address and Billing address if it is different. Then Click “SUBMIT ORDER” done! Q2b. How do I get the shipping Quote? Shipping quote! Really it is super simple. You simply had the square feet or sheets into the cart and click “Checkout”. At the bottom of the page is a super handy-dandy shipping calculator. You just plug in your details for a very speedy quote. That is it. Complete. Then “proceed to checkout”. Q3. How are your prices so cheap? We tried to quickly squeeze the key point into a two min white board video. Then below into even more detail. This was a really common question seven years ago but not so common today as consumers have become used to the lower prices that the internet can offer. Although this is true, this is a question worth answering. I will try to be brief, which is not easy considering how many areas of business and economics this question touches on (and I will not be able to cover them all), but by the end of reading this my hope is you will have some understanding of what the market is and why we decided to start the adventure of change. The title includes cheap. Companies hate the word “cheap”, well not companies but marketing executives, they like inexpensive or good value no matter what we call it the question is still the same. How can we sell a product for so much lower than everyone else and because of this is it inferior? First lets remove the “cheap” issue with an example. We sell premium Carrara Marble to create a backsplash 4×12″ product like this for $8.00 a Square Foot (this is a customer that purchased online and decided to blog about her kitchen renovation with no involvement from us). Boutique retailers sell this for $40-$50 a Square Foot if they can get that size. There is more you can also see some great room scenes here you can also review all our ratings on Reseller Ratings, eBay, Yahoo Shopping, Amazon and Houzz additionally we are graded A+ Better Business Bureau. So cheap second quality, all these thoughts can be put to one side. This is premium Carrara marble. We have challenged every aspect we can think of in this market put customers first and not just in a friendly, smiling, cheerful happy way, but in a way that targets every aspect of this industry from the quarry to our customers. We put people first, we love our products, we want you to love and enjoy them just as much we do not market in the traditional way. It is customers blogging, taking pictures and putting them on Instagram and word-of-mouth that has grown out business. We have never paid for an advertisement in a magazine. Today we are the largest importer of white marble mosaics and tile in the USA with over eight different products of just Carrara stocked in the USA. Boutique retailers sell the same or similar products for 50-300% more. This has no rational reason from an economics perspective supply and demand drives prices (along with excessive costs but that eventually and always drives you out of business). Supply and demand. However you can see the Italian Carrara marble mountains from space, so clearly there is no supply issue. Granted it is not in an ideal position, getting it off the mountain is a challenge. But they have been doing that for well over 1,000 years. So that really should mitigate the getting it off the mountain issue. It does not however require a supply chain of 3-4 steps with each step adding 50-100% which has always been the current method and today still accounts for how the majority of consumers purchase the product. What Carrara marble mosaic and tiles have is the perfect product that has a high “price feel” to it. The fact it is from another country really helps. It cannot be easily got at by the consumer, you cannot go over to Italy and get a block, put it in your suitcase and take it home. Now add huge marketing cost to this mix, high cost magazines pictures, beautiful showrooms along with impressive high cost design consultants and voila you have a market believing a product in plentiful supply is charged 4-6 times more than it should be, due to a perception that has been created without any really good reason. I am sure this is the same for many products. For decades this model had multiple steps in the supply chain huge margins along each step and it seemed to be a train that could not be stopped. Given this it just got bigger and bigger, more marketing expense, more advertising cost piled on top of cost. No one in the Industry wanted change, not the retailers, distributors and certainly not the the big print magazines being paid by everyone in the supply chain no one had a problem as everyone in the process was getting well paid. Excessive profit for all and for the customer to believes in the image and pays the price. There is only one way to recover business costs that have been added to the product and that is to pass it onto the consumer though the product. (it is not just paid for by pixies, I am sorry but for some people this is a revelation). Costs cannot be recovered any other way (unless you are on some Government handout list, but I am pretty sure the natural stone industry is excluded, not really interesting enough for any political party). This is not a personal crusade. Just frustration at what is completely inept way of operating that has little interest in the consumer other than making an over priced product. But I honestly believe it is not intentional it is as if everyone in the chain if simply covering their own self interests, working independently and charging what they believe they can get away with, not looking for value. When all the self interested parties are removed and their costs, you can start to understand why the costs we can offer are so low. Traditional boutique retailers have 2-3 and some 4 steps (if you include your contractors commission) in their supply chain process. Each one adding 50%-100% in which case the pice rapidly rises. Add on all the marketing expensive and you have taken a product that is in plentiful supply and made it incredibly expensive. I wonder why? Most likely it worked. Sales grew. The competition followed no one challenged it. No one understood the costs. Retailers who took on the product lines were restricted by price sheets, they were told exactly what they could sell the product for and what state borders they can and cannot cross sell into in. There were huge restrictions and markets controlled. So a lot of retailers just would not know the cost from Italy, or why the Basketweave they are selling is so high, the reality is they are told to sell at these prices if they wish to sell it. Deviate from the pricing structure provided to them (on a spreadsheet) and they will be replaced. So that incredibly wonderful showroom. That is a fixed cost and people waiting for you to walk in….variable….. these are operational costs that the consumer has to pay for and only one way, through the product. Given this we decided to look at every single aspect of the tile and stone industry from the quarry to the consumer and then change it. Our company method: we ship directly from the Quarry to our warehouse directly to the customer. With this method, we skip 3 to 4 steps in the supply chain and pass the savings along to you. 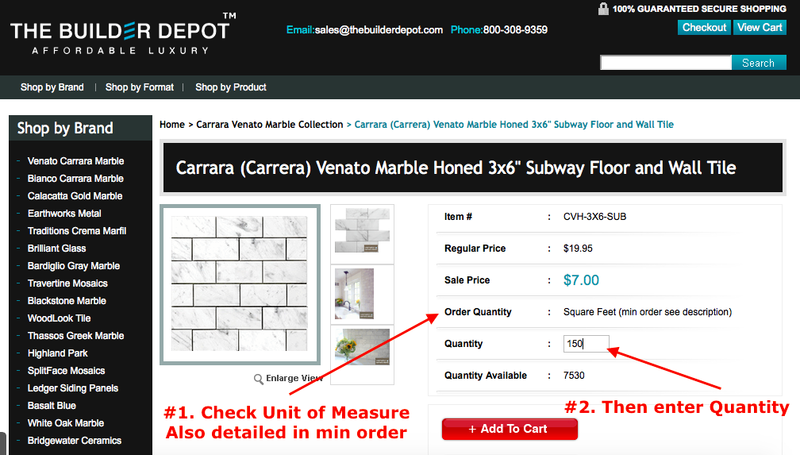 Our company imports directly (strategy #1) taking out 3-4 steps in the supply chain that our competitors the ‘boutique tile and stone retailers‘ have to suffer and in the end just makes their process more complicated than it needs to be. Why do these companies have to suffer an inefficient supply chain? Answer: a retailer cannot buy 28 pallets of 6×12″ Italian Carrara at a time. They do not have the ‘wholesale’ sales to support it nor the place to store it. This goes back to our logical and efficient way of processing: we import the product directly, and then the product is simply shipped straight to you. We work and invest in the factory, the machinery improve and invest we become partners not customer and supplier. Form partnerships with quarries that have the same vision change the current system. In our company, it is necessary to make a profit (yes businesses do strive for that if they are registered as a “for profit corporation”, yet no where near the same as a tile store. The reason for not needing a higher profit is we operate a low cost business (Strategy #2). We operate on a no frills marketing strategy our pictures are taken with an iPhone no advertising cost, it started out this way. But it really has proved a fast and efficient way of taking “real” pictures of products, not photoshopped but how they are as they come out of the containers. We are promoted in magazines and on the DIY network, but we did not and do not pay for this. The value of our products is premium quality at an incredible price that makes sense to the consumer in which our customers want to tell their friends, TV shows wants to tell their viewers, and magazines their readers. It is difficult we grow by word of mouth. Through our reviews. Our company operates with minimal staff, so minimal that answering the phone can be sometimes be a challenge (sorry I know that can be frustrating). I could go on but you get the idea. Quite simply we keep the costs as low as possible. The other strategy which is becoming increasingly important. We carry zero debt. The two million square feet of stock we carry is owned 100% by us. When we decide on a factory, usually the exact same one supplying large American big box retailers or showrooms through a 3-4 step distribution chain already. We do not ask for 30 days, 60 days and some companies even insist on 360 days payment terms. We pay cash. We wire transfer cash, millions if needed. This can save a business and many jobs. But for this, we must be treated as number one. Fastest shipping, best quality and lower cost as insuring our debt is not needed which can cost between 2-4% gross margin. Direct import, minimal operational costs, no frills marketing and no debt, premium products (word of mouth is our marketing). As the buyer, these products do not always come to us cheap; however, it is out goal to offer one of the best deals that can top any competitors pricing. We are a company that is proud of what our business has been able to accomplish; we wanted to create something new and like no other and that’s exactly what we have bought to the market. Customers who create a perfect looking bathroom buying $6K worth of marble and adding $15K in value back into their home price. We are probably one of the few online products that offer an instant value once purchased and installed. Marble adds value to your home. Q4. Are the products per square foot or per piece? This is on the product page right below the ‘sales price’. For example, on the 3×6″ you would get eight tiles, the 3×8″ you would get six tiles, on the 6×12″ you get two tiles as the tiles get increase they work the opposite way. For 12×24″ you get half a tile per square foot – please do not let this be a concern, just order what you need and we will round up to the nearest 12×24″ tile. Our company will not cut in half and send you half a 12×24″ tile. Keep in mind, the mosaics are all sold per sheet. 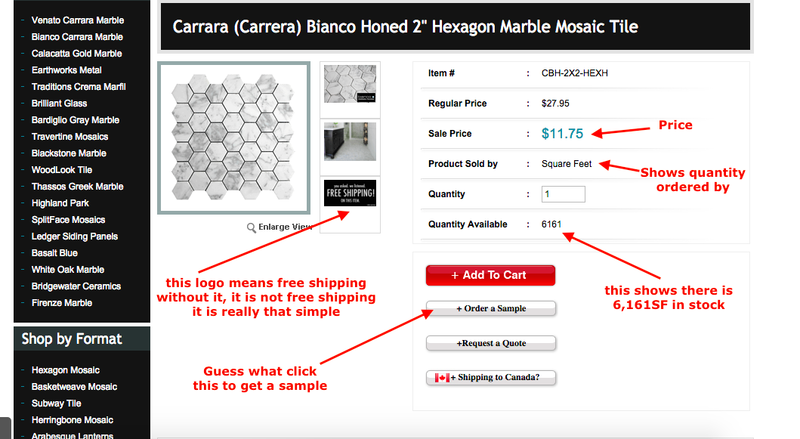 we try to make this process pretty self explanatory- on the 2″ Hexagon unlike most other suppliers our 2″ Carrara Hexagon is larger than a square foot. The 1″ Carrara Venato Hexagon is 0.96SF per sheet, the Basketweave are all 1SF (it is easier on square tiles to be exact) the same for 1×1″ Square, 1×2″, 2×4″, and 2×2″ Square. The trims are all sold per piece. Every trim is 12″ long so technically it is also sold per linear foot (a term used by many contractors). Q5. What does the packaging look like? The packaging is quite impressive considering we are all about lowering the cost. Although this is true, in order to ensure that the marble makes it in all in one piece from Italy, then to Savannah, and then from there to our warehouse directly to your home, retail store or warehouse, we have taken some steps to take further care over the packaging. We are considerate not just for our warehouse workers, but for the end user packing almost all our products in boxes of 5SF. This ensures the boxes are manageable and can be lifted easily (especially lugging it upstairs to the bathroom). Q6a. How long is the sample and order shipping time? Estimated shipping time of your sample and actual order. For faster shipments place the order online, then in the comments write please send me cost of 2-Day and Overnight shipping. Or email your order confirmation to quick@thebuilderdepot.com to speed up your shipment leaving our warehouse (if possible). Do not delay on order placing. For complete orders please read this post about freight and ground shipping times. Please wait until you receive the product before you arrange any contractors or installers to work on the products you have purchased from us. There are many variables in shipping we cannot control (weather for example and if we could believe me, we would not be selling marble) which may lead to potential delays. We make errors as well (they happen). Please wait until you have the product at your home, residence check it and then arrange a day with an installer. Q6b. How long is the shipping time? This follows a little on from the sample. There are two ways to ship UPS Ground and UPS Freight. UPS Ground follows the map above. 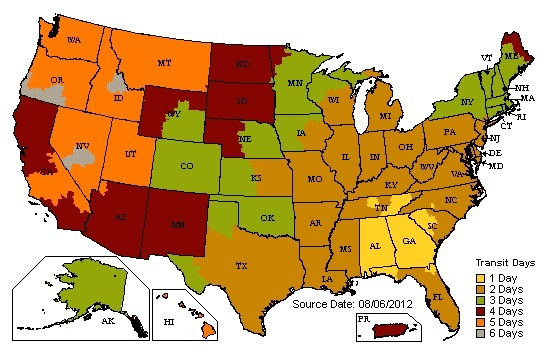 If your order is 40/SF or less it is almost certainly going ground and therefore the above shipping map applies (they frequently beat that map when the weather is good). Shipping Freight. UPS has a handy tool here where you enter your zip codes and it provides an “Estimate”. The last word of that sentence is vital. “Estimate”. They have to go through a few steps to get the freight to you. One is make contact with you. Call you on the number you provided when you ordered. Some people are nervous about phone numbers, so they give out some number they hardly check or assume it is a prank caller and do not answer. Whoops…… add a day to your shipping time. That was the person calling to deliver your shipment. To get around this take control. Be in charge and talk to the shipping company. Instead of waiting for UPS to call you. Call them. Be in control of your order. (they prefer it). Here is some handy tips on how best to communicate to the person stuck in a cubical all day making these phone calls (not fun, so please read). Q7. How much additional product should we order? Take a look at this scenario: you received your product four weeks ago. It is now time for the installation process. Your installer has found that cutting the Herringbone mosaic is trickier than planned, perhaps he/she drops a box of 6×12″ and now you need more product. Paying for shipping is fa headache in itself, but if we run out of stock or we do not have the matching dye lot then that takes things to a whole new level of frustration. To avoid this nightmare scenario just say you want to consider adding 20% extra to your order. 10% is for the cuts and waste on the immediate job. The other 10% is insurance (we’ll explain that in a moment) may lead you too an overload of the product. In this situation, save it. Something may happen in the future and you may need that matching tile. Also remember as you will have read our shipping policy you would have read the section in read noting that up to 5% of the product can be chipped or damaged this is normal (after #13). The remaining 10% is for insurance. If we were a “fly-by-night” company and had no plans to stick around, then this would be irrelevant. Having done this for decades and will continue on for decades, we have customers best needs at heart, and they continuously come back after years asking us if we have 10 square feet of 6×12″ that is from the same lot as their previous order. They had to replace a shower head or some other minor change. This resulted in tiles getting broken. They need the 10 square feet to replace the damaged area. Every time the above nightmare scenario occurs (at least two times a month) for some reason we are somehow to blame. We ask customers to order another 20%, not because we want to increase our sales by 20% but because we do not want the this terrible scenario to occur. Our company has yet to fail anyone and we do come up with the matching product; however, it does add time and additional shipping cost. PLEASE ORDER 20% ADDITIONAL TILE WHEN PLACING YOUR ORDER. Then you are covered and so are we from another panicked, “I didn’t order enough” email. Our company does put into consideration at all times what is best for the customer, and this is why we want to bring this forth to your knowledge. Q8. How are your products shipped? Samples are shipped USPS or UPS, either way you are provided a tracking number. Your main order is shipped either freight LTL (Less than Truck Load) or UPS ground in boxes (roughly 10SF in a box). Usually orders less than 60 to 70SF ship UPS ground, orders with more than 70SF ship freight. (Wood Look Tile orders are an exception to the rule they can be shipped direct from 24 locations with the closest local shipper being used for example in Northeast/Northwest it maybe Pitt Ohio Freight). The freight process is on a truck with a powered lift-gate to lower your shipment to ground level. We break the freight process out for those not familiar with freight deliveries into more detail with a step by step guide here. (A refresher course is always a good idea too). Looking for a UPS terminal to ship to? Then click here and enter your zip code. This terminal becomes your “Ship to Location”, you will want to track it so you know when it arrives at the terminal, UPS will call, but you can call them and that speeds things up if you are in a hurry. More info about that here. Q9. How do I make a return? Good question and so is looking at the return policy before buying anything. We have it broken out into more detail with a “making a return guide” blog post. (Just click the link). As always any questions, comments or help with grammar 🙂 (let us know). Thank you! Q10. What is the difference between Honed and Polished? Honed is not as shiny as polished and lacks the reflective qualities that polished marble has. To the touch, it is velvety and has a satin-smooth appearance. Honed is more scratch resistance as it does not have a gloss finish like polished piece of marble. This property was created because honed marble does not have the reflective surface like polished, consequently when light hits it the marble, scratches are more difficult to notice. This is also true for watermarks and smudges- this makes it an overall lower maintenance product. Polished looks incredibly regal or palatial. The polishing process brings the full character and charm of the stone to the surface. It gives the veining clarity that the honed does not have. Polished marble has a smooth shiny surface almost mirror reflective with its glossy finish. The polishing does create a level of protection (though the sealer should be doing this) for spills and liquids. It still must be sealed. Now should the sealer wear in places without you reapplying, you will get more resistance from the polished than you would the honed. Q11. Do you have a Showroom? We do not have a showroom and this is no accident 🙂 We are 100% online. Showrooms add significant cost to the business ($10 to $30 a Square Foot) and as with any business that cost is passed on through the cost of the product onto the consumer. 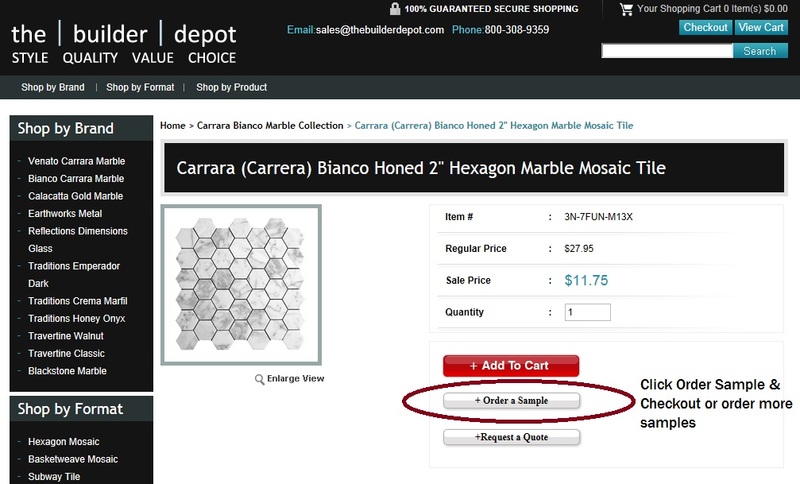 You can get an idea of how much cost by going into a traditional tile and stone retailer. 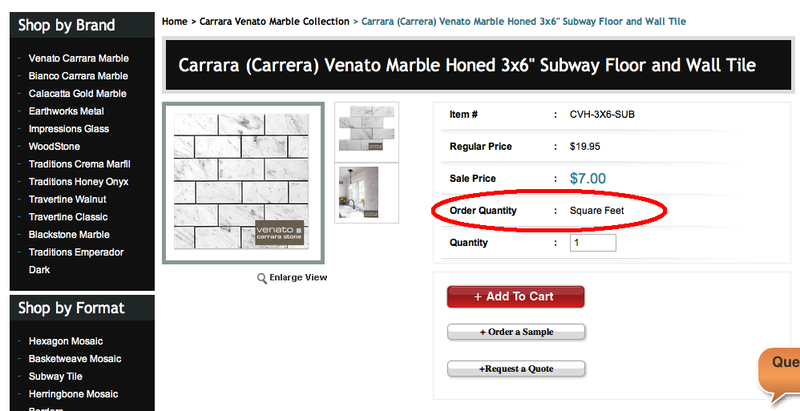 For example Basketweave Carrara (and I mean the real stuff from Italy) can cost twice as much as ours. The other issue with a retail store is the catchment area, for over 90% of our customers (especially those overseas) coming to the showroom is not realistic the distance is just too far. It is not fair that all those customers pay for a showroom that they would never visit. Given this and a strategy to offer the lowest price we have decided against having a showroom. Being ‘local’ does have advantages, you can pick up your order, place a sample order online and then once you decide on your order place it online. You can pick up the order from our warehouse (which is in a great spot), just select “local pickup Alpharetta” (picture of how to do it at checkout below) when you checkout. We are friendly and helpful and you can look through the order before taking it home. How to select local pick-up when ordering. Q12. Does marble need to be sealed? Yes, all natural stone polished or honed needs to be sealed. Q13. Can the shipping be expedited? Ship in next day. We will do all we can that we can control! Then it is pick up by the freight company and not in our hands. The products we sell are heavy. A 50SF of mosaic can weight two hundred and fifty pounds and that would ship freight. (A 20SF shipment could still weigh one hundred pounds and cost $500+ UPS next day air, so I am sure that is not an option either, otherwise you you would be paying $50.00SF from a local retailer). If we are the only option (like you need a couple of matching pencils trims) please email us before 11am EST and we’ll get a overnight rate. If we get it before 11am EST you can get the excess shipping charge paid, we can wrap it well can catch UPS that day. Now back to the larger freight shipment that you need faster. Freight companies like UPS do not offer an expedited rate. The only other option I can think of would be for you to hire a dedicated carrier, you can go to companies like uship.com and see what they will charge to pick up and drive the product to you. My guess it would be over $1,000. If I wanted my shipment faster I would call the terminal (once the tracking number shows me it is getting to the terminal or at the terminal). That phone call would jump me to the font of the line (I would also be super nice). That would then give me priority over all the other people waiting for their call. I am sure you get the point. Please note shipment times are estimates. If this shipment is “super time sensitive” whereby its delay will cost thousands or even hundreds of dollars, please do not order, do not put us in that position. We have had this product in stock for over 10 years. It could have been ordered weeks ago. If it is really, really time sensitive buy locally where you are in control and can pick up the product yourself. Q14. Can I recreate a HGTV or Magazine look? Yes you can! Today it is amazing we are bombarded by images of perfect bathrooms and Kitchens. Carrara bathrooms can add $35,000+ to the value of your home with a $5,000 investment in product and even with an installation cost can pay for itself and then some, there is even a show about it. It is a great investment and you get to enjoy it as well. But please note. These perfect bathrooms were not created by ordering the exact amount of marble. They significantly over order. We worked with DIY Network and then over ordered by 30-40%, this allows them to pick through and remove any tiles that does not fit “the dream”. They lay the tiles out before installing, step back and look, then they move some pieces around. They do this until it looks perfect. They number the wall and then number the back of the tiles. Then they install. They take a huge amount of time but the end result is perfection. The products we sell are so much lower than the local tile retailer, so if you want the perfect look you have to over order. There will be waste. You will discard tiles that do not fit the look you are going for. Do not install box to box. Lay it out, create the picture and then install. This is part of your cost of the product, do not think of the 3×6″ Subway Venato as $7.00SF think of it as $9.00SF as you will have built in product to throw away. Obviously the less perfection you require the lower the cost. Please bear in mind, once installed no one ever looks at ‘1’ tile, they see a marble bathroom, they do not look at it 2″ from their nose like a sample. Finally buying online is not for everyone (gasp…. I will be fired, don’t tell anyone I said that). It is true. This company was not created for everyone (just 80% of the $300bn market). You cannot see a picture on Traditional Homes and Kitchen (unless it was one of the metal tiles which actually are on there that are the same overtime, glass tiles is another example) of a Carrara Bathroom, go online without a sample or asking for pictures and just order. Then when it shows up and be surprised it is not exactly the same as the picture in the magazine. Or worse… order it, leave on vacation and let the ceramic guy install it according to the “Plan” that was made. That is like a General explaining the battle plans to a new recruit and then going off to the Bahama’s on the eve of battle, then being surprised upon your return to see it did not go as planned. Marble is never the same, that is the beauty of it, your bathroom even from the same quarry in Italy will be different to someone else’s they are all unique. It is not a fabricated product, for that you need a Carrara Porcelain. Where every tile repeats 1 in 8 times (that would drive me nuts a big spot the difference/matching pairs game). If you examine every tile 2 inches from your nose, require water jet cut edges, have ‘OCD’ (you know who you are) then go into a retailer. One of the very expensive ones where you can pay the $50-100 a Square Foot price (just for the products) and then hire their designers to create your masterpiece according to your exact specifics. Yes be prepared to hand over tens of thousands of dollars. Increasing or decreasing depending on your specs. If you are in this group buying online is not for you, if you are one of these people but can get to Alpharetta then you can buy it, pick it up and before taking it home look at it. Many do every week without issue, this customer picked up her 3×6″ polished Venato backsplash and it is spectacular, it could not be better. Q15. What are the top 5 mistakes people make? #1. Setting up installers before getting the product. People sometimes see the shipping time and book the installation “Team” to be there on the ETA provided by UPS Freight. The three letter abbreviation of ETA is ‘Estimated Time of Arrival” and Estimated is the key. It does not mean it is showing up on that date. Anything can happen during transit. Weather. Traffic. Any number of uncontrollable events can impact your shipment. Wait until you have it. Then check it, then call for the “Crew” to install. Otherwise the “Crew” could be sat around on that day of the “ETA” with nothing to do and you would have to pay them. Please do not call us demanding that we pay your crew because it was not on the day of the ETA, it is an ETA. If we could control all aspects of the roads, weather, etc and get it to you on an exact date none of us would be here. Because we would have just invented a new and very clever machine. Teleportation. #2. Not being there. Order the tile to be shipped to your “summer home” have your guy who does not deal with tile receive it. Have your installer show up (an unqualified marble installer) and go by the plan you and he sketched out a month ago. You need to be there, you need to be involved. Do not then after winter arrive at your “summer home” to find things not as you expected. The Hexagon that was supposed to go on the floor is on the ceiling for example. #3. No sealer used. We are not installers, but you need to Pre-Seal before grouting and then seal all natural stone. DuPont that small $50bn company is not selling so many sealers for the fun of it (remember to seal before grouting) this is the #1 skipped step right behind not sealing. A lot of tile guys have just had enough when they have completed the job, they want the rest of their money and they want out. The pub is calling 🙂 It is an exhausting job. The thought of sealing all the tile is not a nice one. You cannot see a sealer very well. So they just skip it. Or try and tell you it is polished and polished tile does not need sealing. This is a lie. They just want to make it to Happy Hour. Natural Stone must be sealed. This is how I approach it. “I went online and found this sealer called Bullet Proof by DuPont it is really well rated and one that I will have to use again in 3-5 years.” I have never sealed tile before. Would you mind awfully if I watched how a professional does the sealing. You now solve two issues A) You get to secretly micro-manage the sealing and B) You will know how to do it when it is your turn. Do follow the instructions on the sealer. It is so important that the marble is sealed. Particularly in the shower where it will be (potentially) bombarded multiple times a day not just by water but soap and other detergents. This constant drenching with detergents and other non-natural liquids can have some unpleasant negative impacts on the marble. Sealing will drastically reduce this. Especially so on the Venato, it is a whiter stone. The base is whiter. You bought it for this reason. Now you have to look after it. All marble has mineral deposits these deposits can change color if the marble is not sealed. So seal it. Take care of it. Watch the installer. Let the sealer dry before use. Read the instructions on the sealer and re-seal regularly, especially in the shower. #4. Not ordering enough. This tile is no doubt about it, is a fantastic deal. Incredible prices, so much so we had to write how we are able to do it. But do not take it as an opportunity to try and order the ‘exact amount’ and not over spend by $1.00. Do over order. Consider 15-20%. It is still a great deal. Save the extra. Another reason is you are ordering from a LOT of marble a particular moment in time millions of years ago when the block was created. If you order more, need more the chances of it matching and finding that exact lot from millions of years ago it unlikely. Finally (and I am sure there are other reasons to over order) customer come back years later after installing a new glass door or changed something and tile has cracked. They need the matching lot, from five years ago. We do not have it. You at the time of ordering had the chance to have it nicely stored in the attic. Carrara bathrooms can add $35,000+ to a property value, investing a few extra hundred dollars in some back up tiles is a great insurance policy. For you or the next home owner (how about that for a nice sales feature when you come to sell your home, just incase you wish to make any changes we have the exact lot of 30SF in the attic). #5. Wrong ship to address. Amazing the number of people that order 3,000Lbs of stone and do not check the ship to location. I need not go into detail on this one, but the percentage is very, very high. And finally I am just putting this one in call it #5.5. Not blending the tiles or doing dry run. The fastest way for the installer to do his job, get paid and get on to the next job, is to just go from box to box and throw it down. No, no, no….. you want to pull from different boxes, do a dry run, make sure it looks right before you stick it down. Not after. Blend the tile my young Padawan. Take your time. Be a Jedi of marble installation. Or at the very least install marble as it should be. You should have been paid to install marble tile. Not ceramic tile. You were paid more because the job is incredibly more complex and requires more skill. There are certifications. A number of steps that must be done. If these are skills you do not possess please do not take the customers money. (If the installer is really cheap this is a red flag). Q16. What information is provided on the product page? Not on all items, if it is it is a BONUS. Do you see the front page, the section in Red. It is not even small print either, we try and be really clear. It states “BONUS Free Shipping on Many Items”. So that does not mean free shipping on all items. Let’s look at this a step further. We have included Free Shipping Logos to make this as simple as possible. Picture below. Logo, and yes it is Free Shipping. You can see the Free Ship Logo. Ships for free. Technically in the “system” it has zero weight. It is weightless. Shipping is charged on weight so if we remove the weight then it is free shipping. That simple. See this item. No Free Shipping Logo. So it will not ship for Free. 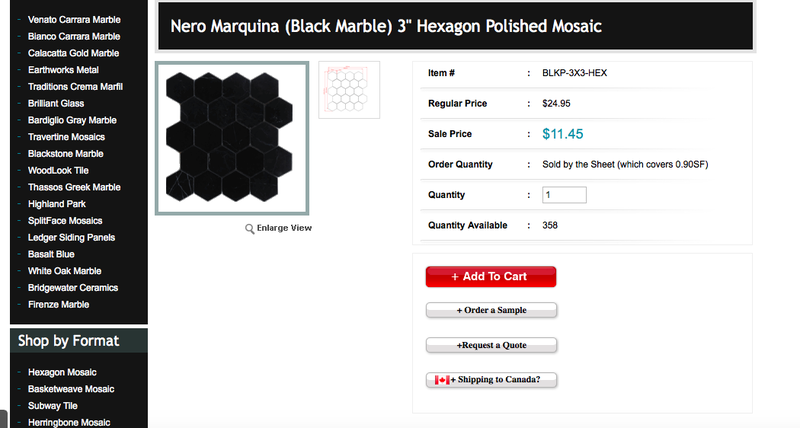 Now lets say you order them both 200SF of the 3×6″ and 100SF of the 2″ Hexagon. The 2″ Hexagon ships as it weights ‘zero’ it has no weight at all. Test it, add 300SF of 3×6″ and you will see an increased shipping cost. Reduce it back to 200SF and put in the Hexagon and you have your 2″ Hexagon shipping for free. It is a great deal. One more for fun. I have not put any arrows on this item. So is this a “Free Ship item” or will there be a “Shipping charge?” Correct. It does not have a Free Shipping Logo so it will pick up a shipping charge (I am sorry we have to go into this detail, and I can remove names and if you would like a good laugh at some of the emails we can send them on, they range from “why can this product just not be sent via drone into my 16th floor in NYC?” to “why is everything not free?” How do you respond to people like this, they can leave reviews. Presumably unless they are bank robbers someone had a job at some point which allows them to buy products. I am sure when they worked or still work, they expect a paycheck, why would they expect any different from anyone else. The really, really scary part, these people are allowed to vote and drive). Now please read no further if you are not ready for the truth or a candid, upfront few paragraphs of truth. If you wish to continue believing that the world provides things for FREE then read no further…… Spoiler alert! Okay, so here we go. In business, buying products, commerce, NOTHING IS FREE. I am sorry to burst anyone’s bubble but all the commercials on TV about “Free Shipping” are a marketing gimmick. Think about it. Really just for a moment……. How does the product get to you? UPS ground, FedEx? Do you think these shippers said to a company. “We think you are super nice people we would like to ship your orders for free. Our drivers who have families to feed and mortgages to pay have decided that they would like to not be paid on the delivery of shipments for company ABC. They are happy for their children to go hungry and live on the street. They are refusing to accept any pay to deliver products to you“. COME ON!!!! Really??? You really believe there is FREE shipping? You believe this, really, truly believe it? No there is not, what there is, is a landed cost, a delivered price for an item of quality and size. A product can have its price increased to pay for the shipping. That is the #1 way to offer free shipping. I like examples: The product is for sale $10.00. Now Marketing Dept. says, consumers are not smart, so make it $13.00 and say “Free Shipping”. The consumer will be like bee’s to honey “Wow! They will say“. Now assume you need 200 units and your shipping is really just $232.00. You have actually over paid for that “Free Shipping” 200 units. You could have paid $10.00 a square foot and $232.00 for the shipping cost. The Free shipping total is $2,600.00 and the product (the way we charge upfront, breaking out the shipping cost, no gimmicks) is $2,232.00. Do you realize over 70% of the American population pay the extra money, because of the word “Free”. We are assuming our customer base is smarter and not tricked by words. We have to assume our customers know better. And the reality is if they do not, they have no business trying to install or buy Carrara marble. It is simple math. Remove the emotion and do the calculation. There is also this “Free Shipping” trick. Make the product smaller (you can see this below in Figure #1). So our Penny round (the white one) is an entire square foot. Not mentioning any names but a competitor who is offering free shipping, is selling 0.76 Square Feet to a sheet (the black one). They do not mention this. This is how some are paying for your “Free Shipping”. Simply shipping you less, and using that extra profit to cover the shipping cost. Image #1. How the competition is attempting to compete as we change the industry. Make it smaller and not tell you. By the time you are through the installation it is too late you assume you have not measured correctly or something went wrong. Information is just omitted. So what do you do? You have no choice, you have to order more. As you have an installer who is costing ‘X’ and you want the job complete. Games and Gimmicks. Something we will not do. But we will expose! Q18. How are your Palletized products shipped? Carefully via UPS. Actually the real key to success: over two hundred and fifty square feet generally we put inside a wooden crate. These are expensive and protects the product on all four sides. You can see this picture below of product inside a wooden crate. On top is a packing slip and do not double stack notice. Which we have agreed with UPS. Smaller shipment. Banding is the key. Can take over 2,000Lbs, then the banding is protected and attached to the pallet. You will notice that the pallet has space around the edge. This is because UPS will likely with the pallet truck in hit a corner, we need then to hit the wooden pallet. Not the product. In short we are experts. Did we come up with this overnight? No with over 100 years of logistics experience and our Board of Advisors consists of Alan Shearn he has managed over 1 million square feet of warehouse space, 20,000 trucks and 100 million shipments a year. This knowledge gives us a distinct advantage. This is our Bianco 2″ Hexagon Honed mosaic in a clothing retail showroom. Our marble is not just used in your bathroom. We sell to retailers and I do not mean retailers that then sell to consumers (we sell to those guys as well), but actual high foot traffic commercial retail stores in New York City for example and other major cities around the world. 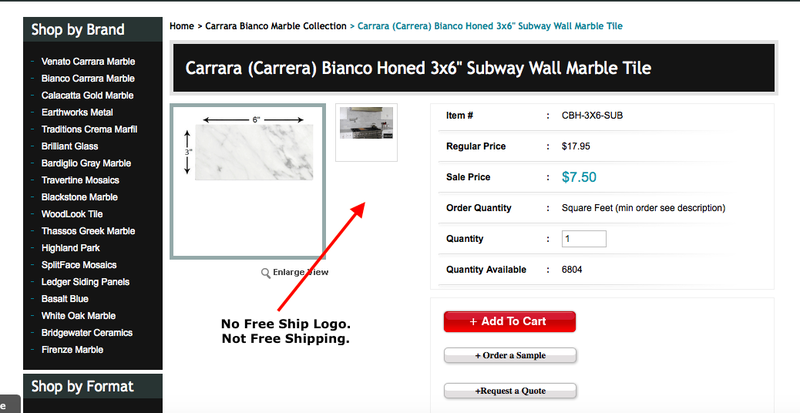 Clearly these are premium stores, you would not put Carrara on the floor in Walmart (they have concrete). Q20. Are you a Member of the Marble Institute of America? Yes. Yes we are. That can be confired by entering (under the Companies Search) The Builder Depot and our Address 5910 Shiloh Road East on the MIA Member search page we are also graded A+ with the Better Business Bureau and a Google Trusted Store along with a huge number of reviews on our page “about The Builder Depot“. This model works with signifiant supply chain improvements removing waste explained above in FAQ #3 with a white board video (we managed to make it in under 2 mins). Remember this is a website. You are buying from us. We do not make sales calls or hire sales people. We simply import the very best and then allow the consumer to decide. We like to think of this as a “Buffet of Marble and Products” in a Buffet you walk in and pay. You can sit down and nothing happens. (Okay you may get a drink). They will not serve you, the expectation is you get up and get your food. For a full service program (or restaurant, I am trying to make an analogy) you would go into a high end boutique retailer and pay 3-4 times the cost. If you wish to take advantage of our lets face it, almost unbelievable prices (so unbelievable we had to explain how with a video) then we need a little assistance to complete our process of the business model. Just like the buffet system requires the consumer to make one more step to finish their model. We need the customer to read, that is your step. Read the terms of sale and and the shipping policy, more time please read FAQ’s here on this page and our here paying attention to the top mistakes made by others. If nothing else and time is against you or you just do not like reading, then skip to the errors made by others. Why make them again? Someone else already did, learn from their mistakes. Q21. How do I track my Order? 98% of all customers seem to have this one down. We hardly ever get this question. But there is just a few, so let’s cover this for the 2%. Once you order you will receive two emails. If you use gmail.com, yahoo.com or hotmail.com it will most likely be in your “spam” folder check it. You will be emailed a confirmation directly after you order. So if you do not have it, it is in your spam folder. Then the second email is crucial this is the tracking email. You see the hyperlink and the tracking number (or PRO# as shippers like to call it), that you will enter into the site to track your shipment. This is the first email the confirmation shipping is at the bottom, please check it. You really, really need to check the ship to is correct. You cannot change it once it is shipped. So take a moment and please check the ship to. The amount of people who spend $7,000 and never even check the ship to address is amazing it is around 6% of all customers. Do not be the six percent. This is the second email. This is when we have shipped it. At this point it has gone. In is no longer with us. Please do not email and say “oh I need to correct the shipping”, you needed to do that on the confirmation. At this point there will be a charge. As UPS will have to unload an entire trailer to pull out your pallet and then re-label and load it onto another. This is how UPS and freight companies makes a lot of money. Fees! Do not let them. For freight orders, you click the hyperlink below your product and enter in the tracking number (just cut and paste it in) or as freight companies like to call it PRO number. (Not sure why, but they like that term in their world of freight). This will then take you to the tracking screen, scroll to the bottom their is a down arrow expand out the tracking and see it’s progress and ETA. This is Freight delivery an order greater than 30 square feet. The wooden pallet support the tile. It is strong well packed and durable. Ready to take on UPS and it’s journey across the USA. (Actually it is fairly tough it made it from Italy after all). What will it look like when it gets to you. Scroll on up to FAQ#18 and take a look. How is it delivered? Curbside delivery. Scroll on up to FAQ#8 it explains it and even takes you through the step by step guide of curbside delivery: step by step guide here. Need More? We have a couple of movies…..
Do you have a showroom in GA or TN? We do not and this is part of our lower cost strategy. This is answered partly in “how are your products so cheap”. We estimate that a showroom would cost us/you (our customers) an additional $5.00 to $10.00SF onto the cost of the product. With insurance, renovation, etc. I just wanted to establish whether the checklist of recommended installations that includes “shower” means shower floor, shower wall, or both. Hi Barbara, Yes it does. It basically means it can be used in all wet areas, but if the product is porous (check put water on it and see if soaks in, if it does not bead up then it is porous, most natural stone (actually all that I know of and Cement Tile). Then you should seal it with a companies products one the professionals use is the StoneTech line by DuPont (you can buy direct from them online, little point us selling what they sell online).